….IT’S TIME FOR THE STATE FAIR AGAIN!!!! Food, fun and rides are all elements of the State Fair of Texas. The annual celebration this year runs from Sept. 30th – Oct. 23rd , with gates generally open from 10 to 10 daily. Whether you are there just for a deep fried peanut butter and jelly sandwich or to enjoy the livestock exhibitions, the Fair has seen great success since its simple beginnings in 1886. In that year there was one group that wanted to develop fair grounds, but they argued over where to build it, so broke into two groups. One group built in the current location and the other just north of the city. That first year was not very successful so in 1887 the groups merged their efforts once more and purchased more land in the current location to include a horse racing track. When gambling on horses was outlawed in 1903 the group was forced to sell to the City of Dallas, with an agreement that each fall there would be time set aside for the annual exposition. And it has been that way every year since, with only one exception. In 1918 the State Fair was canceled due to World War I and the park converted into a temporary Army encampment. *Know how you are getting there and what the weather will be like. Check out the DART schedule for real convenience. *Dress comfortably, with good shoes and don’t forget the sunscreen! *If you are in a group, set up a meeting spot from the start in case your group gets separated. *Keep track of where exits are in case of an emergency where you have to leave the park quickly. *Stay hydrated, especially if consuming alcohol. *Stay sharp and look over rides carefully before getting on in case there are obvious mechanical problems. 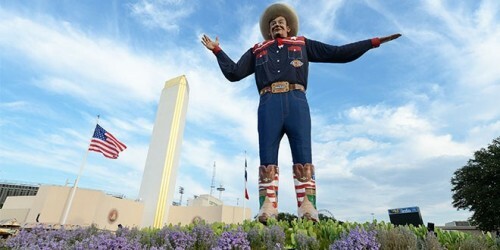 For more information about this year’s State Fair of Texas go to bigtex.com. And anytime you need more information about the Rules of the Road just log on to WirelessDefensiveDriving.com.